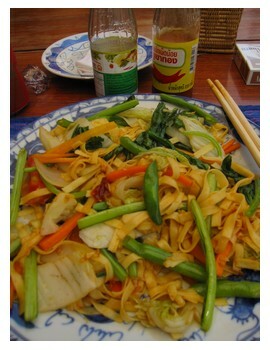 Looking for cheap food in Siem Reap? You can choose from Khmer, Thai, Mexican, Vietnamese (Soup Dragon), Indian, Italian (Ecstatic Pizza), French and so much more! What you'll also notice is that many restaurants are owned by westerners. 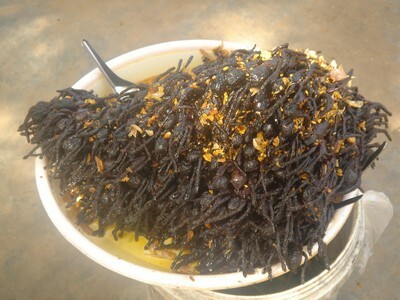 So if you're craving for Western food, that shouldn't be a problem in Angkor town. Head for the markets and food stalls on the Eastern side of the river near National Route 6. In the evenings, food stalls set up all over town. The most visited are the ones just outside Red Piano, near Sivatha Road and Pub Street (4,000-8,000 riel, open from 16.00 - 03.00). Select your meat on a stick (barbeque chicken) and order some plain sticky rice - that will make your mouth busy! Fish-lovers shouldn't get disappointed either - they have amazing fish which you can dip into a combination of lime juice, black pepper and some salt. A simple meal and CHEAP! If the food is too salty for you, soothe your tongue in fresh fruit juices ($0.5)! You have more food stalls at the Old Market (Psar Chaa) where the locals come in to have breakfast and lunch (4,000-8,000 riel). Some stalls have a menu on English, but otherwise you can just look into the pots to see what they're cooking. Want European bakery goods or ice cream? Upstairs you have a very modern white lounge with huge comfortable bed/sofas. It's a great place for you to cool down if you want to escape the hot weather! And when it comes to the food, I tried the chicken sandwich and the cappucino - excellent, but a bit overpriced. 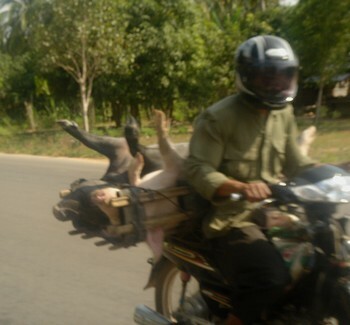 But then again, restaurants that serve Western food in Siem Reap, is all in all overpriced. 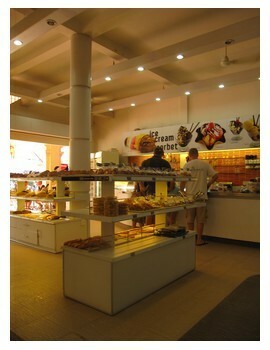 When I visited again in April 2012, the place was packed with tourists and some backpackers. Most of them were sitting in the AC-lounge on the 2nd floor where they have wi-fi access. A good place to cool down from the Siem Reap hot climate! Soup Dragon has probably the best Vietnamese food in Siem Reap! 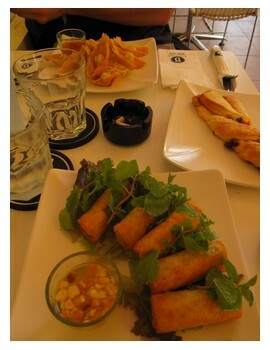 They also serve Moroccan, and of course Khmer food, along with some pizzas. Their menu is extensive and you just want to try out everything, so use your time! ;-) I tried their simple Vietnamese noodle dish, and it was delicious! What caught my eye when I looked in the menu was their statement saying: "7 cents of each dollar goes to Angkor Hospital for children." 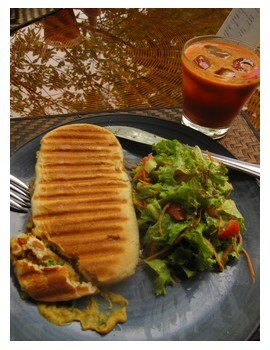 At Peace Cafe, grab some paninis and salads! I tried the panini roast pepper with hummus ($4) and the panini with mozarella and tomatoes ($4), and they were alright. The food tastes healthy and surprisingly delicious. All healthy vegetable drinks cost only $2! If you're not keen on their food, you can try yoga lessons, monk chat, meditation, pilates. And if you want to learn basic Khmer, you can learn it right here for free (Saturdays and Sundays, from 04.00-05.00) pm! Another great thing about this place is their vegetarian cooking classes ($20 included lunch and recipes - booking is not necessary). Cooking classes are offered daily from 11.00 am to 01.00 pm. My first impression wasn't that appealing because it didn't look like an ordinary restaurant to me. But when I finally entered this multi-leveled building, I was amazed by the unique concept. 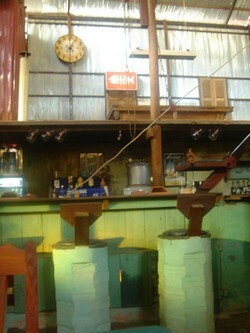 It looked like an old factory inside as the whole place used corrugated iron and low roof beams. 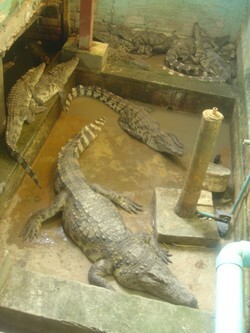 They even have a croc pit in a corner - you can feed them for a dollar. They serve good Khmer, Thai & Western food - I got the spicy eel dinner. Spicy of course, and delicious! On the street sign outside, they advertised for live bands and Khmer dance performances. It's also a good place to hang out, and drink beers on their big comfy pillows. There's not much people during daytime, but more crowded in the evenings. It's a free school for underprivileged young Cambodians. If you want to try something new, and want good Khmer or Western food, this is the place to go. All meals are prepared by the students at Sala Bai, ranging from $7-9. I visited Sala Bai the first time in 2007, before the business really took off. The students were still in class or something and one of the responsible persons working there greeted me with a big smile. Closed in the evenings, weekends and public holidays. 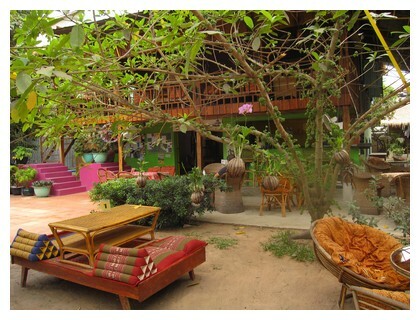 Looking for a guesthouse or hotel in Siem Reap? Our review of Koulen 2 restaurant where they have Apsara shows! 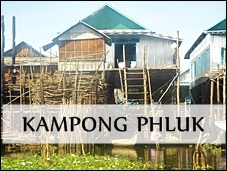 - Need information on bus companies that run in Cambodia? 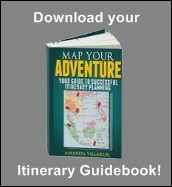 - How to book bus tickets? - Duration of bus journeys?